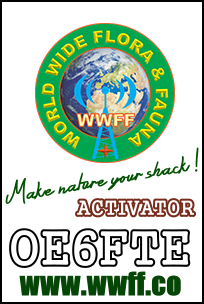 Please use the below Clublog OQRS in case you require a QSL card and I will be happy to send one your way. I try to QSL 100% via the OEVSV bureau and to send paper QSL cards to everybody who indicates “via bureau” on his/her QRZ.com page. I also do direct QSL: Please drop me an e-mail and I’ll send a card via postal services for sure (no greenstamps, IRC’s etc. required).